Well, I finally made some Oreo truffles! I chose Golden Birthday Cake Oreos. I actually prefer the golden version over the original and chose the birthday cake variety because these were for a birthday celebration (small though it was) for our black lab, Riley. 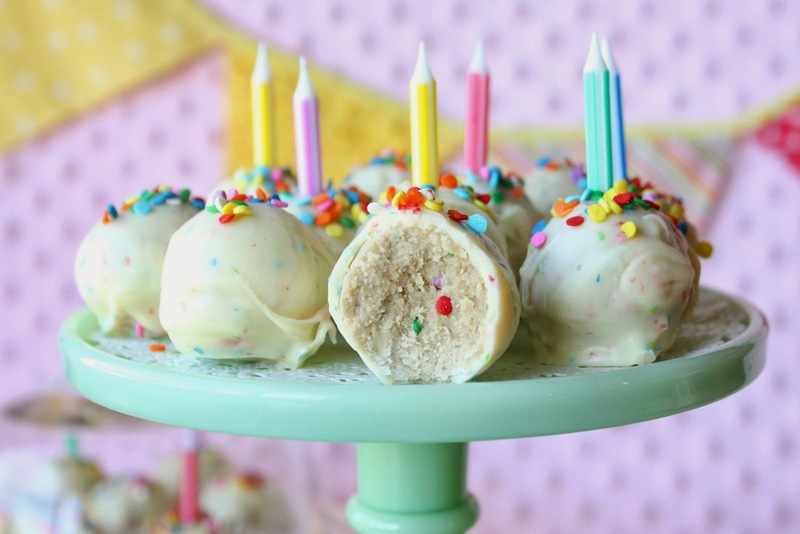 Don't tell Riley, but I actually used her birthday as an excuse to make these cookie truffles, and I'm glad I did! They were very easy to make. 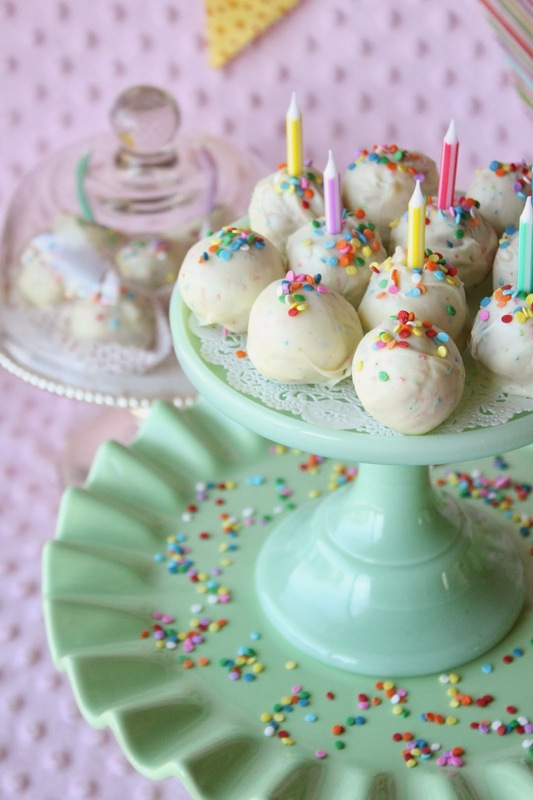 I changed the recipe up a bit from the other Oreo truffles that I came across by using some vanilla frosting (in keeping with the birthday cake theme) as a mix-in, instead of cream cheese. I also used birthday cake flavored candy melt for the outer shell. They were for a birthday, after all. Do you see the little specks of color sprinkled in the creme filling? The perfect start to a special treat. The truffles come together quickly with the store-bought sandwich cookies. a fun and tasty birthday dessert. Of course, we also had "Birthday Party" ice cream:) Birthday sweets overload you say...Never! Look at her gray whiskers...at nine, she's getting old, and I know how she feels, haha! Our dog is eight days younger than our oldest grandchild, and we picked a lab because they have such a great, long-standing reputation for being wonderful with children. In Riley's case it couldn't be more true. Place all the cookies into a food processor until finely ground. Add the frosting to the cookies until well incorporated. Place the cookie mixture into a bowl and add 1/4 cup sprinkles. Mix in. Shape into 1-inch balls and place on parchment lined baking sheet. Place the baking sheet in the refrigerator for about 30 minutes. Prepare the candy melt according to package directions. Dip the cookie balls into the melted candy and place on the lined baking sheet. Add the sprinkles, and slightly push a candle into the top of the cookie. 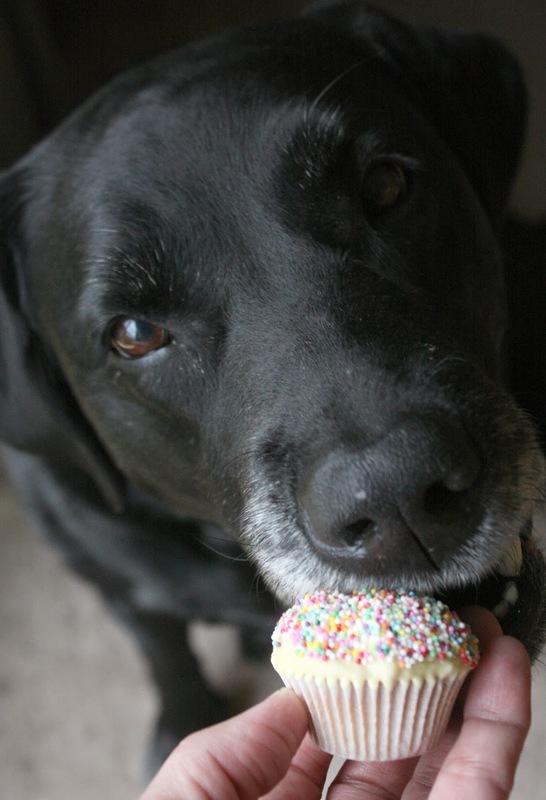 Of course the treats sound wonderful, but I'm smitten with these photos! So pretty, so fun, so sprinkle!! <3 'em! Oh, these look great! I love the golden oreos, too! Happy birthday to your puppy and your grandchild. Lovely and delicious clicks and truffles, Sue. I have never seen golden oreos over here. My next door neighbor just got two black lab puppies, such cute little fur balls that bounce around ... makes me want to get a puppy! talk about a lucky dog! :) and the colors are so delicious! Thanks for sharing this recipe, Sue. I have a birthday coming up soon and I've been looking for a treat idea. Happy birthday to Riley! I love Oreo truffles, but I haven't made golden ones yet. They look absolutely beautiful. And I'm dying over those cake stands! 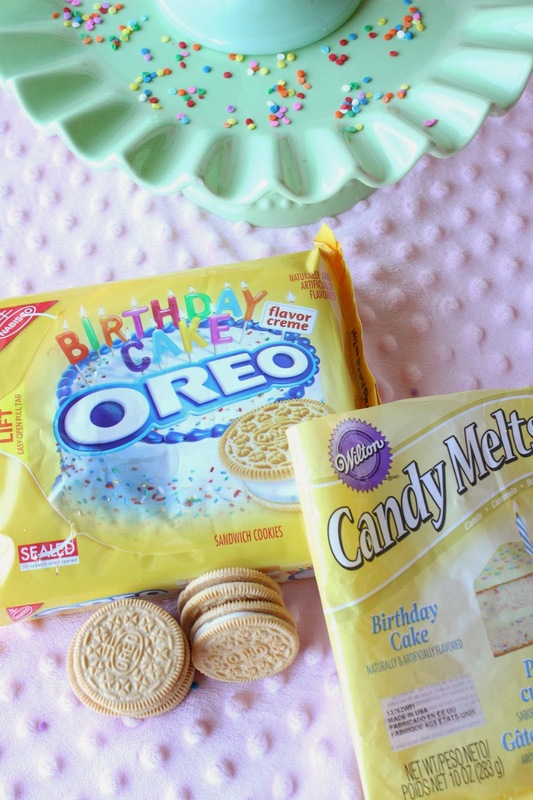 I haven't seen the Birthday Cake Oreos, but just tried the Chocolate Chip Cookie Dough ones - yum! I made these with Circus Animal Cookies - super good. I agree, the dark Oreo just isn't my favorite for these and I like frosting instead of cream cheese- then I don't have to worry about refrigeration. I love your birthday cake candy melts! I haven't seen those either. March is big birthday month for us here so these would be fun to try. 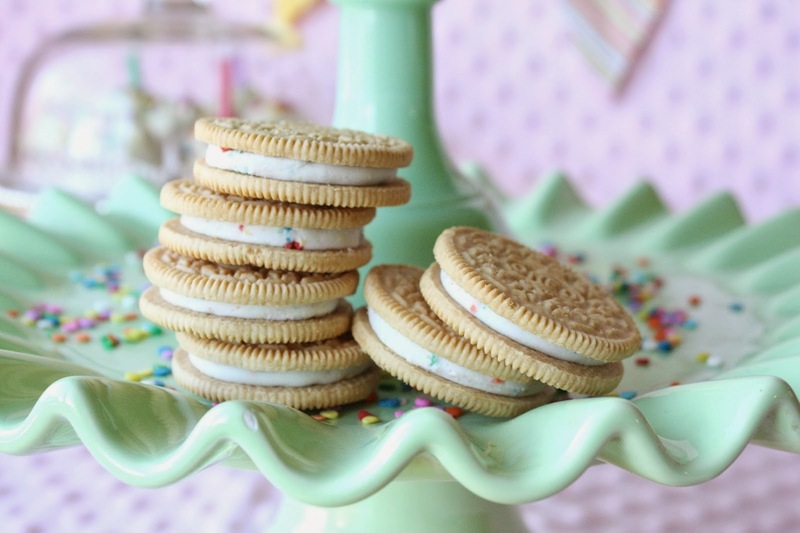 Oh so pretty, the Oreo's the photos, the cookie truffles...everything makes it seem like spring! happy birthday to riley! those truffles look so tasty too! 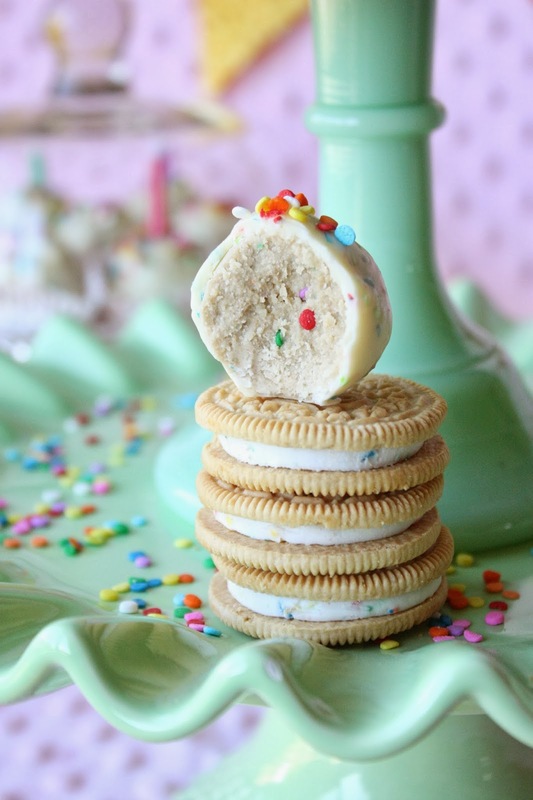 ohh, I love those Birthday Cake Oreos! One of my favorite flavors...next to the mint!